More than sixty contractors and invasive weed removal technicians attended the Invasives Science Live event. The one of a kind show exhibited the latest research and technological happenings in the world of invasive weed control. 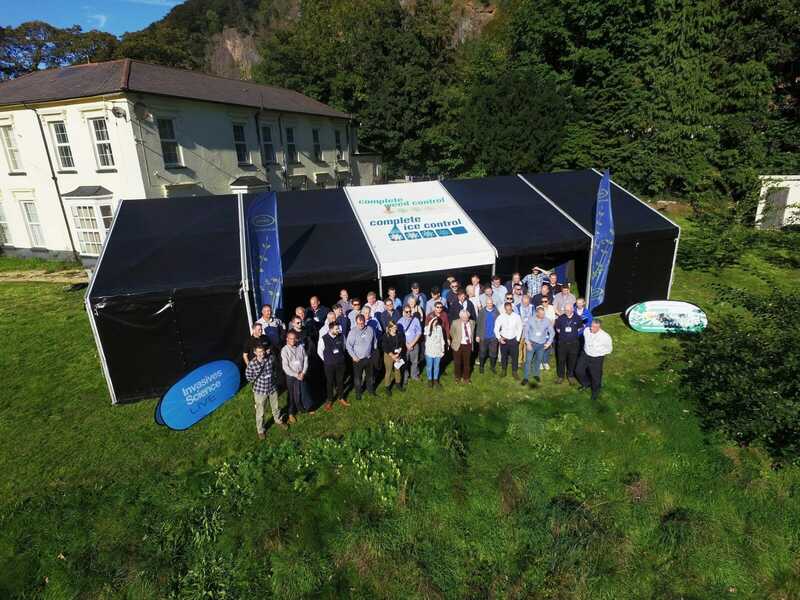 The event took place in Cardiff and was hosted by ICL, Complete Weed Control and Green-tech alongside Advanced Invasives. It provided an opportunity for attendees to gain a vital knowledge of chemical performance and various control methods. Japanese Knotweed and Himalayan Balsam were the focus of the event. Complete Weed Control Managing Director Ian Graham kicked off the show by offering an insight into the recent trial work with Advanced Invasives – something which the delegates would find out more about at the impressive private trial facility. Roundup Technical Development Manager Barrie Hunt from Bayer was the first orator to give an update on the legal and best practice information for glyphosate. This was to assist planning ahead for their 2019 weed control schedules. Dr Dan Jones, Managing Director of Advanced Invasives,was to follow. He gave an insight into their seven year-long field trial on Japanese Knotweed control. This study was the largest of its type in the world. The ai:LAB is the company’s 12 acre field-testing site situated in South Wales. Here, research has been undertaken into the best way of tackling invasive plants in real-world situations. The research tested nineteen methods over three years of treatment. It has raised the bar for evidence-led research. After Dr Dan Jones was Business Director Dan Clugston. He explained the menace of Japanese Knotweed, how best to approach it’s eradication, and the devastating effect it can have on a premises. A lunch was enjoyed by all after which delegates were taken to the closeby trial site where they were separated into three individual groups. Each group visited three specific work stations. Iván Martin from Advanced Invasives told of how a number of estate managers are reluctant to use herbicides to control this plant. ‘Balsam Bashing’ - physical control, is a popular treatment for a lot conservationist groups. He then revealed research which consisted of benchmarking the four most commonly used balsam treatments in 5×5 m (25 m2) commercial field trial plots. Of the all of the treatments tested, herbicide spraying was not only the quickest but was also was the only treatment that did not create plant waste . Iván claimed it is a major plus side that needs to be taken into account when considering the environmental benefits of various treatment options. Sophie Hocking from Swansea University and Complete Weed Control’s Ian Graham were on hand to explain how re-invasion by knotweed and secondary invasion by other plant species can often hinder future development. Sophie and Ian explained the necessity of moving from a single, target species approach to a whole ecosystem method of recovery. This station highlighted the ongoing research which looks into the role of the functional traits of plants in habitat restoration, and the broader, long-term dynamics of Japanese knotweed invasion in field conditions. Sophie and Ian summed up by claiming that the work will create a better, more scientifically informed basis for habitat restoration and give a clearer insight of Japanese knotweed dynamics and the habitat aftermath of invasive species dominance. ICL’s Henry Bechelet and Dr Gareth Bruce from Advanced Invasives talked about how stump treatment can be extremely effective as the distance the herbicide has to travel to reach the underground rhizome — the target of all herbicide treatments — is dramatically reduced. They went on to show research in which three stump treatments were tested against Japanese knotweed, in triplicate 5 x 5 metre (25 m2) plots, with a control plot and also a single out-group comparison to stem injection treatment. All of the stump treatments tested were statistically comparable in effectiveness to stem injection. Results concluded that Ecoplug Max® treatment is easily the safest of the stump treatment application methods.